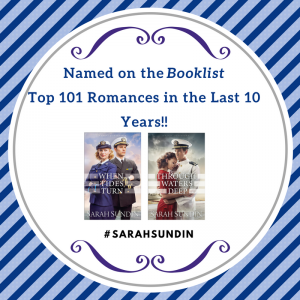 Planes thundered overhead, artillery rumbled in the distance, and cries of wounded soldiers pierced Georgie’s ears. “Coming through.” Two medics rushed past with a litter. A man writhed on top, a shock of red on his gray-green field jacket. Another medic assisted a soldier who clutched his twisted, bloodstained arm to his chest. Wartime medical treatment occurred on muddy battlefields under fire, in tent hospitals only miles from the front, and in sterile stateside hospitals. A complex chain moved patients to where they could best be treated. At all points along this chain, decisions were made regarding when to treat, when to return to duty, and when to evacuate further to the rear. These units were attached to combat units and followed them into battle. 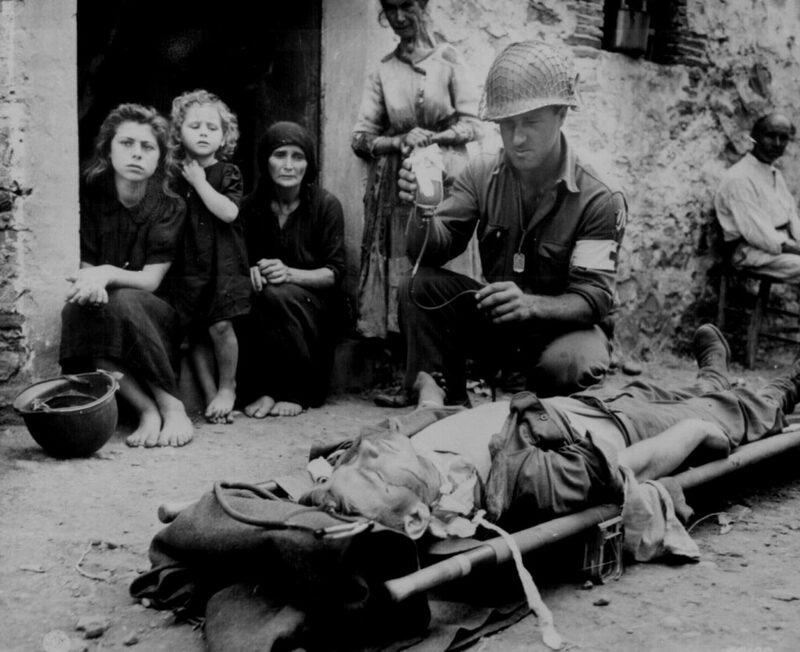 Battlefield: Medics performed first aid and moved the wounded to the aid station, often under fire. Battalion aid station: About one mile from front. Physicians and medics adjusted splints and dressings, and administered plasma and morphine. Soldiers also reported to the aid station for treatment of minor illnesses or mild combat fatigue. 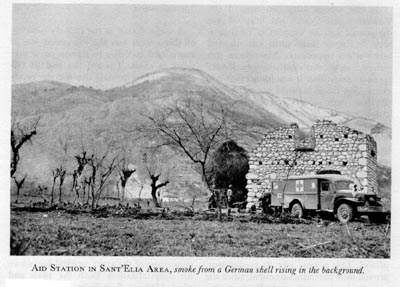 Collecting station: About two miles from the front, near the regiment command post. Further adjustment of splints and dressings, administration of plasma, and treatment of shock. Clearing station: About four to ten miles from the front. Here they treated shock and minor wounds, and grouped patients in ambulance loads for transport to field hospitals. These hospitals were assigned to a theater of operations and could be packed and moved quickly to follow the battle lines. 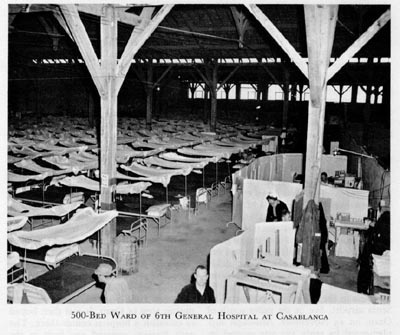 They were complete hospitals with nursing care, surgical and medical wards, X-ray, laboratory, and pharmacy. 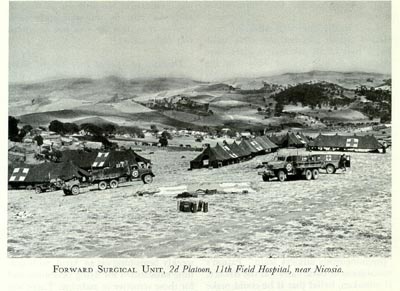 Field Hospitals: Within thirty miles of clearing station. Ideally, the wounded arrived within one hour of injury. Surgery was performed for the most severe cases. Evacuation Hospitals: Treated illnesses and less urgent surgical cases. Patients could be reconditioned here to return to the front. 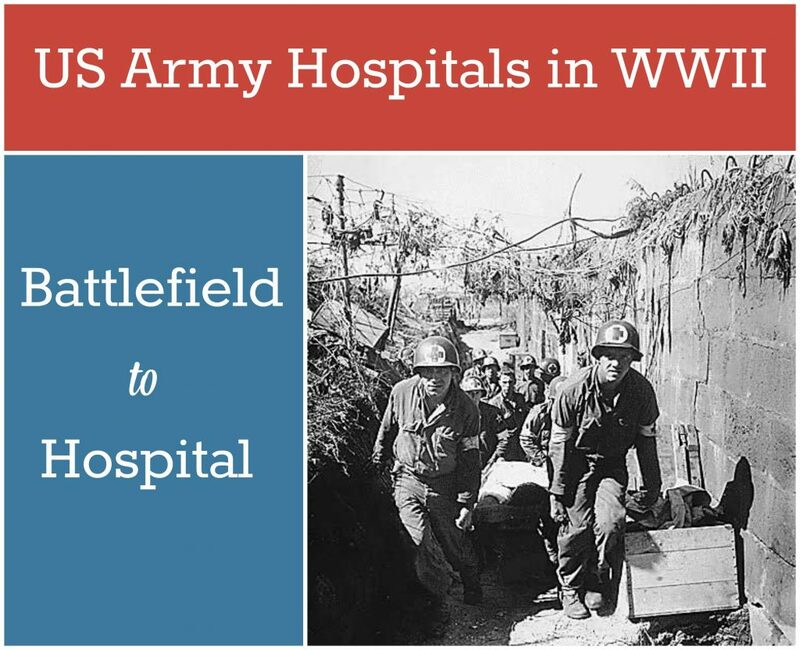 These hospitals were set up a safe distance from the front, either in the theater of operations or stateside, and they tended to remain in one location for longer periods of time. Station Hospitals: Usually attached to a military base, designed to treat illnesses and injuries among personnel stationed at that base. General Hospitals: Large facilities where patients received long-term treatment, sometimes grouped in large complexes. Some of the general hospitals were specialized for certain types of wounds or illnesses, such as for craniocerebral, spine, eye, chest, or neuropsychiatric care. Convalescent Hospitals: Designed for rehabilitation of the severely wounded soldier who would receive a medical discharge. This type of hospital was a World War II innovation. Cosmas, Graham A. & Cowdrey, Albert E. The Medical Department: Medical Service in the European Theater of Operations. Washington, D.C.: United States Army Center of Medical History, 1992. Wiltse, Charles M. The Medical Department: Medical Services in the Mediterranean and Minor Theaters. Washington, DC: Office of the Chief of Military History, Department of the Army, 1965. Condon-Rall, MaryEllen & Cowdrey, Albert E. The Medical Department: Medical Service in the War Against Japan. Washington, D.C.: United States Army Center of Medical History, 1998. Links, Mae Mills & Coleman, Hubert A. Medical Support of the Army Air Forces in World War II. Washington, D.C.: Office of the Surgeon General, USAF, 1955. Had you lived during that time do you see yourself as having trained to be a nurse? 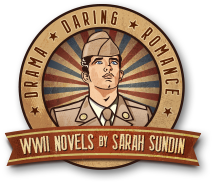 I just finished teading about a wartime love story set in Italy. It was very good. The Tuscan Child by Rhys Bowen. Have a good evening. Sadly, no. I’ve always been squeamish, which is why I chose pharmacy. I’ve heard wonderful things about Bowen’s writing!